The continuation of our double world-champion driver line-up, further consolidation of our championship-winning engineering team and a subtle, yet deep-reaching technical update of our car all underpin the world-class strength, experience and ambition that exists at Vodafone McLaren Mercedes ahead of the 2012 FIA Formula 1 World Championship. This morning’s technical presentation of the MP4-27 at the McLaren Technology Centre showcased a natural evolution of last year’s six-race-winning car and underlined the message that the new season is very much one of growth through strength and continuity. After finishing second in both the drivers’ and constructors’ championships in 2011, our aim for the new season is to fight for both world titles from the very start of this year’s campaign. While the all-new Vodafone McLaren Mercedes MP4-27 closely resembles last year’s multiple race-winning car, the 2012 chassis has been substantially revised from the ground-up, with all major systems updated or re-designed for the new season. The most evident visual differences include more tightly waisted rear bodywork, developed to improve flow to the rear of the car, and a revised cooling system, which re-directs the gearbox oil-cooler. Last year’s U-shaped sidepods have also been re-designed – a legacy of the FIA’s new exhaust regulations that redefine the shape of the rear bodywork. Maintaining the belief in the validity of strengthened continuity, Vodafone McLaren Mercedes is the only team in Formula 1 whose driver line-up consists of two world champions: Jenson Button and Lewis Hamilton. Between them, they have scored 22 grand prix victories for Vodafone McLaren Mercedes and are the strongest and most consistent driver line-up in the sport. Maintaining the partnership into a third successive season was merely a formality. On the technical front, our exemplary engineering trio Tim Goss (director of engineering), Paddy Lowe (technical director) and Neil Oatley (director of design and development programmes) once more remain at the forefront of the drawing office. For 2012, they will be joined by sporting director Sam Michael, whose arrival coincides with the re-organisation of our trackside personnel roster to ensure both growth and development within the group. 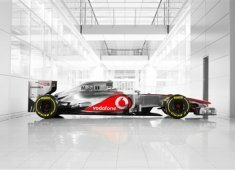 Away from the track, the team continues to develop, too: Vodafone McLaren Mercedes last year became the world’s first carbon-neutral Formula 1 team, efficiently managing its carbon footprint and purchasing carbon credits to completely offset its emissions. As well as continuing relationships of record-breaking length with partners such as Hugo Boss (31 years), TAG Heuer (27 years), Kenwood (22 years), ExxonMobil (18 years), Mercedes-Benz (18 years), Hilton (eight years) and Vodafone (six years), our new strategic partnership with GlaxoSmithKline continues to gather pace. Development and planning continue on the McLaren GSK Centre for Applied Performance, while GSK’s Lucozade scientists are busy developing a groundbreaking cockpit drinks formula to hydrate our drivers during grands prix in 2012. Finally, in a year when the world’s spotlight will shine on London and the 2012 Olympics, we’re proud that equipment and technology pioneered at the racetrack by Vodafone McLaren Mercedes and developed by McLaren Applied Technologies will be used by Team GB’s athletes in their quest for Gold this summer.